The damage from aphids comes from several causes. The first is just their intense feeding, and the removal of a large percentage of the fluids that the plant itself needs for proper growth and nutrition. Aphid feeding can result in discoloration of the foliage, leading to yellowing or spotting referred to as chlorosis. When the feeding is on new buds of leaves or flowers it can cause serious distortion of the plant tissues, and when it is flower buds may result in either badly damaged flowers or no flowers at all. This distortion of the plant can also be caused by chemicals in the saliva of the feeding aphid that change the growth pattern of the developing leaves. Many aphids also are incriminated as vectors of plant diseases, most of them referred to as “plant viruses”, such as tobacco mosaic, tomato mosaic, cucumber mosaic, or plum pox. Aphids – may have wings or be wingless, and if with wings they are held “roof-like” over the abdomen. Cornicles usually present. The abdomen is pear-shaped and antennae very long. Adelgids – similar to aphids but lacking the cornicles. When winged the wings are held roof-like over the abdomen. 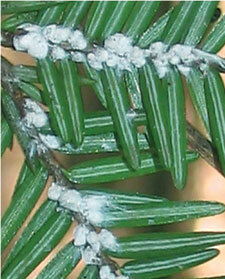 Most of the common pest species are wool-making, covering themselves in dense white fluff and infesting conifers. Pylloxerans – also similar to aphids but without cornicles. Winged forms hold the wings flat over the abdomen, not roof-like. Antennae are 3-segmented. They do not infest conifers. Some species may cover themselves with a waxy powder but do not produce the copious waxy threads that cover entire groups, as with aphids and adelgids. Psyllids – also called jumping plant lice due to their strong hind legs and ability to jump rapidly when disturbed. Winged forms hold the wings roof-like over the abdomen. Antennae are long and often held to the sides when at rest. Psocids – this group includes our common indoor “book louse”, but a number of species may be found on plants, are called “bark lice”, and are NOT pest problems. They feed primarily on molds and algae and not on plant tissues. One kind that is common in southern states may create massive layers of webbing on the trunks of trees, and is dubbed “tree cattle” This webbing causes a concern to the tree’s owner, but it is harmless and should be ignored or washed off. Plant psocids are similar to psyllids, but do not have the jumping hind legs, and if disturbed will walk away rather than leap. When winged the wings are held somewhat flattened over the top of the abdomen. If you have concerns and want a Free Home Inspection contact Lady Bug Pest Control Specialists for a Free Home Inspection for Termites, Eco-Friendly Pest Control, Home Seal Service, Bed Bug Eco-Heat,and Rodent Control. We perform Complete Home Inspections at no charge. Please feel free to contact Lady Bug Pest Control Specialists to answer any questions or for a FREE Inspection. 480-833-1111.